What I have been writing about may seem extreme to some Americans. 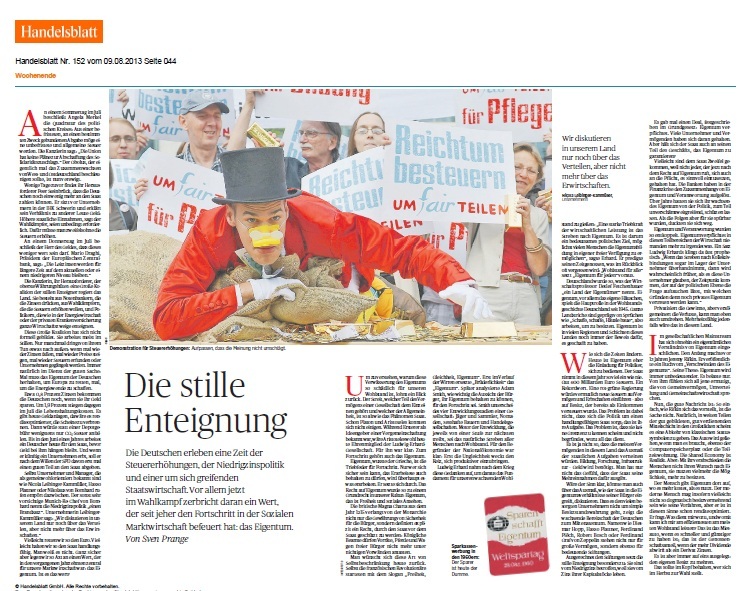 But in Europe where the economic decline is in full bloom, the “Handelsblatt – Germany”, the leading newspaper on business, has come out with an article entitled The Silent Expropriation (Die stille Enteignung). This is the most respected newspaper so it is not the lunatic fringe. What I have been writing about is starting to make the mainstream press in Germany – rising taxes and falling economic growth. The overall tone is the rise in taxation and the confiscation of wealth. This lethal combination is destroying the economy and eliminating job growth for the future. Europe is ahead of the curve. What we may see is their economic decline sends capital in a flight to the USA going into 2015.75, then everything turns down from there and this time the fall should be faster and deeper than what we saw from the 2007.15 high. This is being caused in part by the fact that liquidity has also declined from 2007.15 and remains at about 50% of those levels. Therefore, understanding the timing will be ESSENTIAL to survive this one. You may not be able to get out if you wait for the last minute. Even proprietary trading will not be covered at the banks so we are likely to see even less trading liquidity than before or even currently. State economy that is more authoritarian.